Early autumn and the tapering off of the monsoon season makes for wonderful hiking weather, not to be wasted. I was still irritated that I had not gotten close enough to an outcrop of the Canovas Canyon Rhyolite the previous Friday to get a sample. I was not, however, anxious to get my car stuck in the boondocks again. 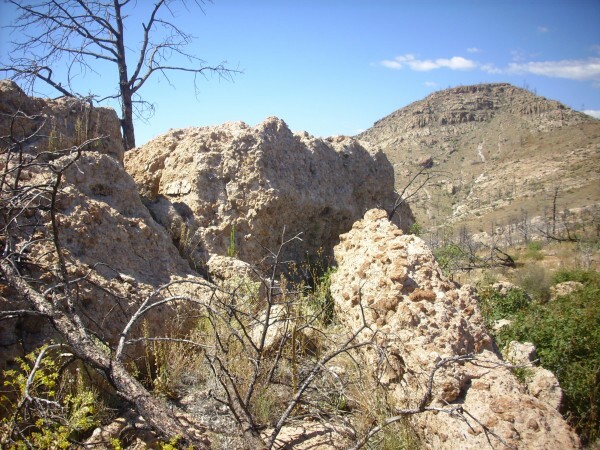 Fortunately, there are outcrops of Canovas Canyon Rhyolite near the San Miguel Mountains, and it can be reached via one of the better gravel roads in the region. I’ve driven the length of it before in my Korean clown car, though it was touch and go crossing Eagle Canyon below what used to be the Dixon apple orchard, where the road has been largely washed out by flash floods. Anyway, I would not be going that far. The Canovas Canyon outcrops are some distance off the road, but not too far. The outcrop southeast of Cerro Balitas looked to be perhaps half a mile off the road, over ground which, while it lacked a trail, looked relatively level on Google Maps. My route took me from White Rock west into the Jemez along State Road 4, then south Forest Road 289 past Graduation Flats. (Named for the traditional post-graduation bacchanalia by Los Alamos High School students.) This is all very familiar ground, but just before reaching the turnoff to St. Peter’s Dome, I got a a glimpse of a Bandelier Tuff mesa through the trees that was lit particularly well this morning, and stopped for a photograph. This is a pretty nice example of the Bandelier Tuff, because the contact between the lower Otowi Member and the upper Tshirege Member is so obvious. Passing the turnoff to St. Peter’s Dome, I was in slightly less familiar territory, and the gravel road, excellent up to this point, became just a little worse. It’s still suitable for passenger vehicles in good weather, but only if you takes a little extra care. I stopped at the Cochiti Canyon overlook, which I had never photographed in quite so favorable lighting. 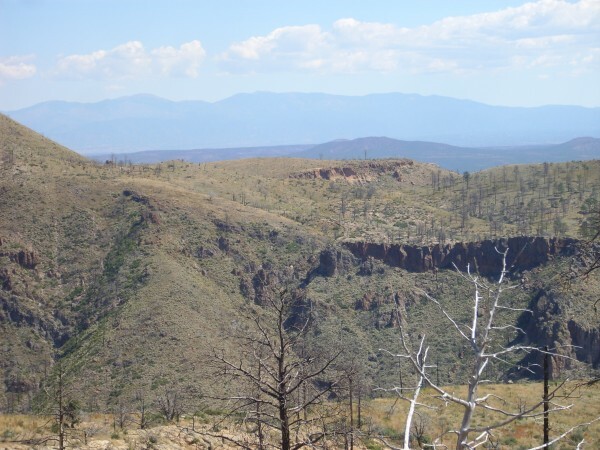 The canyon is rimmed with Bandelier Tuff, but the slopes and wild terrain in the bottom of the canyon are Paliza Canyon Formation volcaniclastics: Broken rock from the volcanic activity that produced both the San Miguel Mountains and the mountains visible here on the skyline. 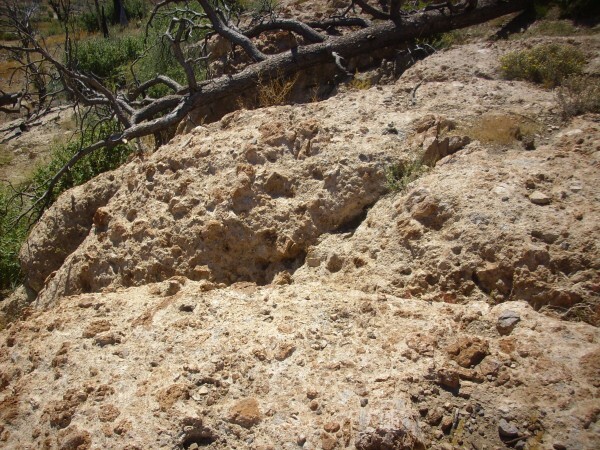 These eruptions long predated the Valles eruptions that produced the Bandelier Tuff. A thin ash bed in the canyon wall, just visible halfway down the slope in the second frame, has been dated at 9.5 million years old, versus 1.6 and 1.2 million years for the main two eruptions that produced the Bandelier Tuff. You can see here that the terrain over which the Bandelier Tuff erupted was heavily eroded and quite irregular. 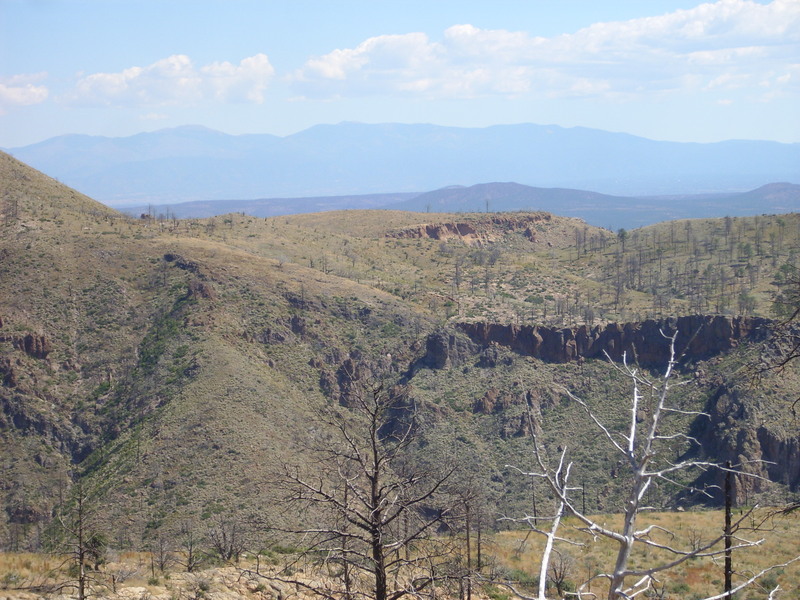 The upper part of the modern canyon, to the right, coincides with a paleocanyon that was filled with a great thickness of Otowi Member, Bandelier Tuff. This exposure includes some tent rocks, which are fairly common in the Otowi Member. 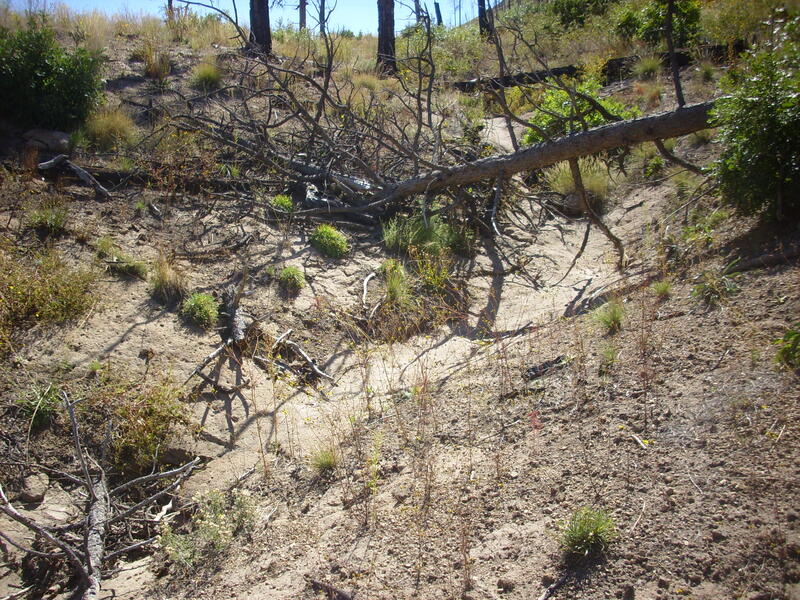 The darker band partway down the tent rocks is probably a layer of ash that is full of rock fragments. This is seen in many parts of the Jemez, and it has been interpreted as the point in the eruption when the caldera began to collapse. I continued on to Cerro Balitas, parking at a (very poor) side road northwest of the hill. Cerro Balitas is composed of Bearhead Rhyolite, a formation that has been dated to between 6 and 7 million years old. It is surrounded to the north with Bandelier Tuff, but the area to the southeast is underlain by the Peralta Tuff Member of the Bearhead Rhyolite. I figured I’d grab a bit of that while I was in the area. My route would take me around the north and northeast flank of the hill and along a ridge of Peralta Tuff to the southeast. The geologic map shows that the Peralta Tuff along this ridge is underlain by a flow of the elusive Canovas Canyon Rhyolite that has been dated as 10.5 million years old — quite old for the Jemez. 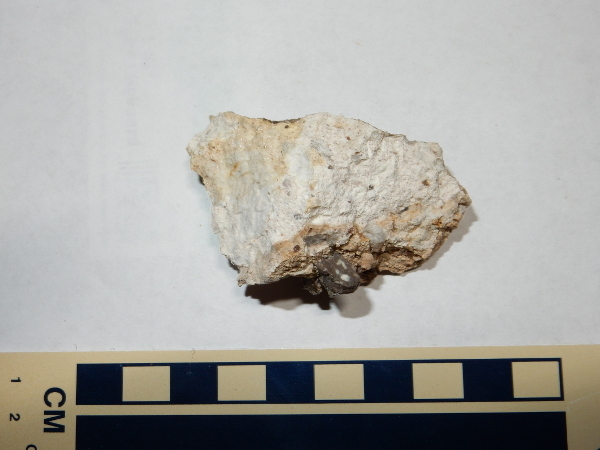 I would have to be sure that my sample was actually Canovas Canyon Rhyolite, meaning I would have to be sure I had hiked past the Peralta Tuff and had not hiked onto a small eruption of Paliza Canyon andesite that pushed through the flow some 8 million years ago. As I said, Google said the ground was reasonably flat, though there were a number of gullies I would have to cross on the north flank of Cerro Balitas. I also found that the ground was covered with scrub, and some of the weeds had quietly gone to seed and produced extremely obnoxious prickly seeds that seemed to jump on my socks and burrow through to prick my feet and ankles. The thorns and seeds would be a constant nuisance and a source of numerous scratches by the time I finished my hike. Partway up the flank, I encountered my first outcrop of Bearhead Rhyolite. Well, it doesn’t look like Bandelier Tuff, anyway, but we’re right on the boundary between the two. 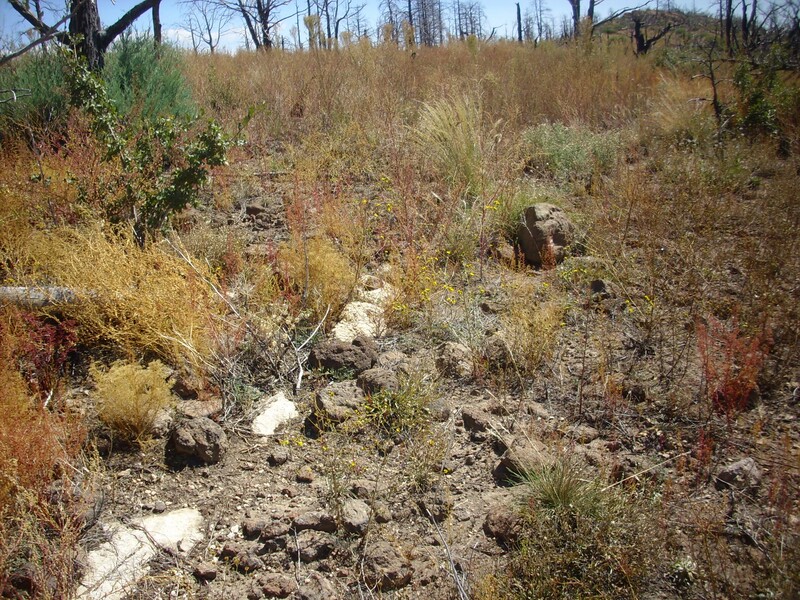 I found that the lower slopes of Cerro Balitas were steep and covered with heavy, thorny scrub. On the other hand, the gulleys coming off the hill became large and deep further down. I tried to find a happy medium. I was struck that the gulleys were not carved in soil, but actually were carved into what looked like solid Bandelier Tuff bedrock. I also discovered, when I took this picture, that I had dropped my pencil somewhere and could not write down coordinates. Well, at least I hadn’t dropped a piece of electronics; I’m laden with a camera, GPS locator, and cell phone on these hikes, and I can spare a pencil much better than them. Still, shucks. I paused somewhere on the northeast flank of Cerro Balitas for a panorama of the San Miguel Mountains to the northeast. The southern Sierra de los Valles are the distant skyline in the first frame. St. Peter’s Dome appears as the flat topped mountain near the right edge of the second frame. Cerro Pico dominates the third frame; we’ll see a lot more of it today. The flank of Cerro Balitas fills the final frame. 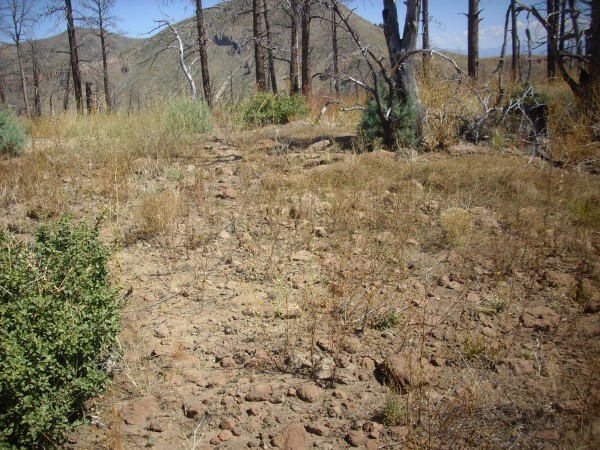 The gully across the panorama is a small tributary to Sanchez Canyon. It may be a usable path into the canyon, if you’re a lot younger and more energetic than me. It’s probably easier to raft down the Rio Grande and hike up the canyon. Sanchez Canyon cuts through some early formations associated with the Jemez volcanic field, including a Canovas Canyon flow 12.4 million years old. 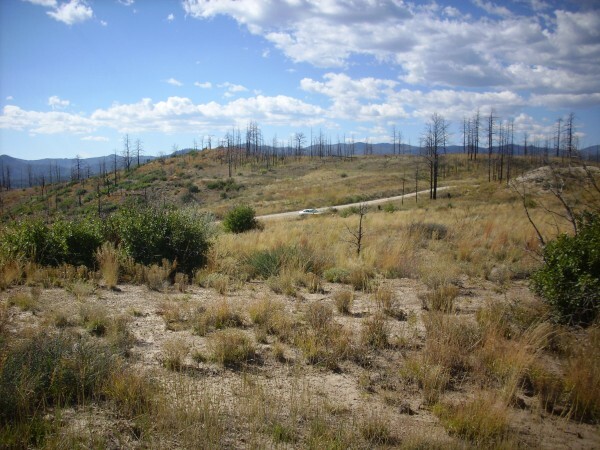 This whole area screams for more attention from a professional geologist, but it is very rugged terrain and difficult to get into. Continuing around Cerro Balitas, I came across an outcrop that immediately caught my eye. The two dark rocks at lower right are actually partially embedded in the white tuff around them. It is an indication how energetic the eruption was that it could sweep up such large blocks and carry them along. 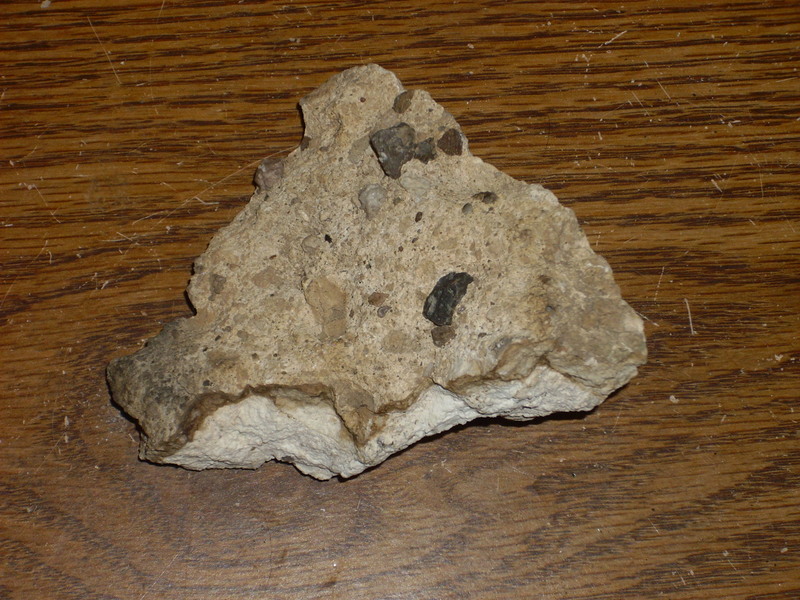 This is almost a conglomerate, but cemented by red-hot ash rather than minerals brought in by ground water. Well, cool. I hadn’t come here looking for this; these unexpected finds are often the most satisfying. I grabbed a chunk. I finally came around the flank of Cerro Balitas, well stickered, and found myself having to jump across a very deep gully cut into what has to be El Cajete Pumice. 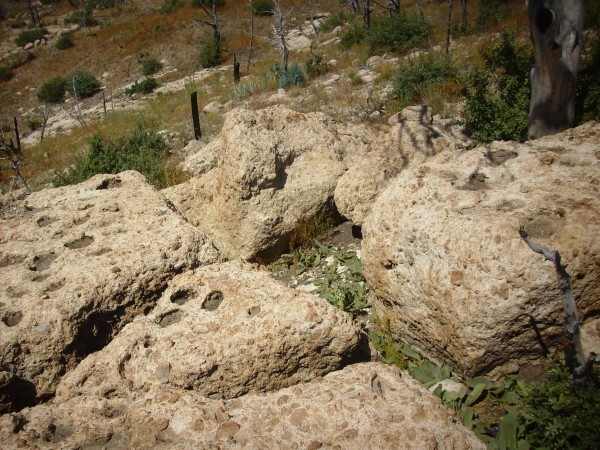 The El Cajete Pumice was erupted just 55,000 years ago or so — estimates vary wildly because such young rocks are actually harder to date. 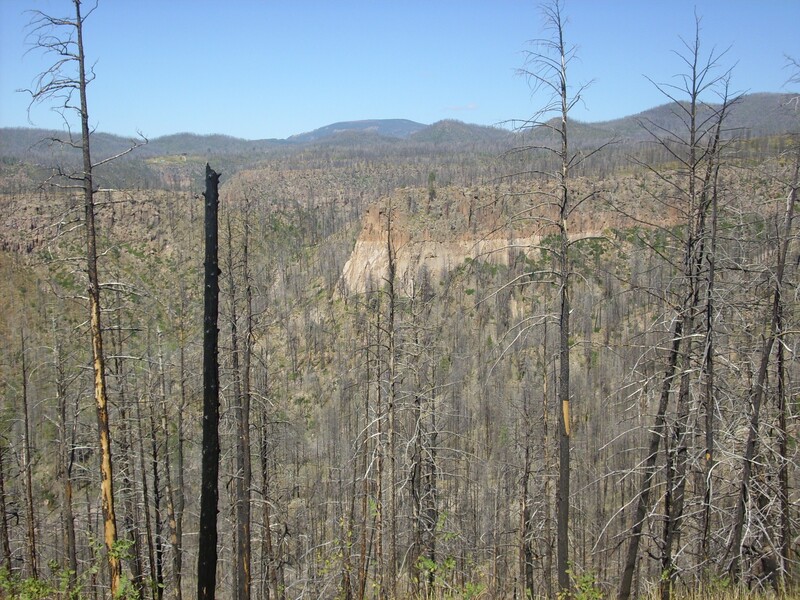 This was the last episode of volcanic activith in the Jemez. 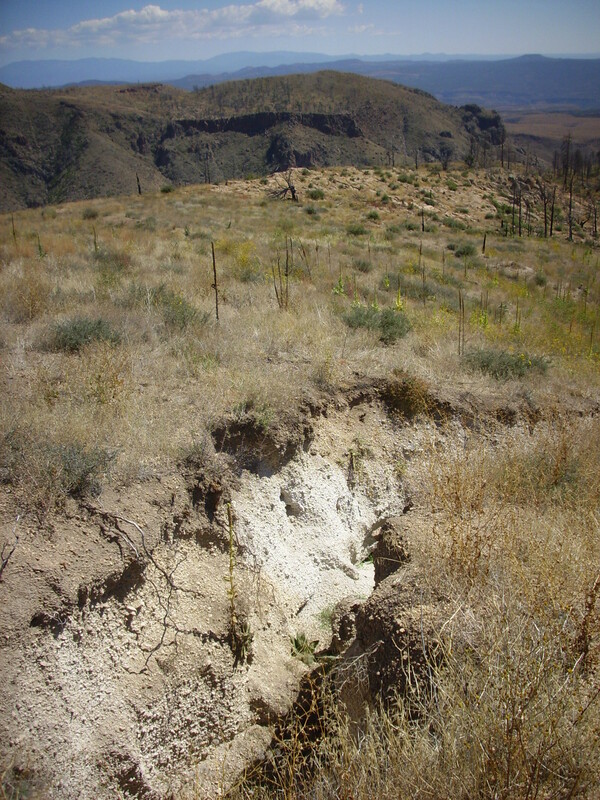 The pumice was spread across the southern Jemez clear to the White Rock area, and it is fairly extensive on mesa tops in Bandelier National Monument. I was tired of walking on scrubby rock-strewn slopes; I decided to climb up the Peralta Tuff flow southeast of Cerro Balitas, so that I could walk for a while on bare rock-strewn flat ground. This required a bit of a scramble, but not permanent damage done. And it was time for another panorama. The panorama starts to the northeast, looking at St. Peter’s Dome and Cerro Pico. Sanchez Canyon is visible in the second and third frames. The fourth frame looks along the ridge I will be hiking down; the furthest hill on the ridge is the dome of Paliza Canyon Formation andesite that I want to avoid and the area in front should be the coveted Canovas Canyon Rhyolite. 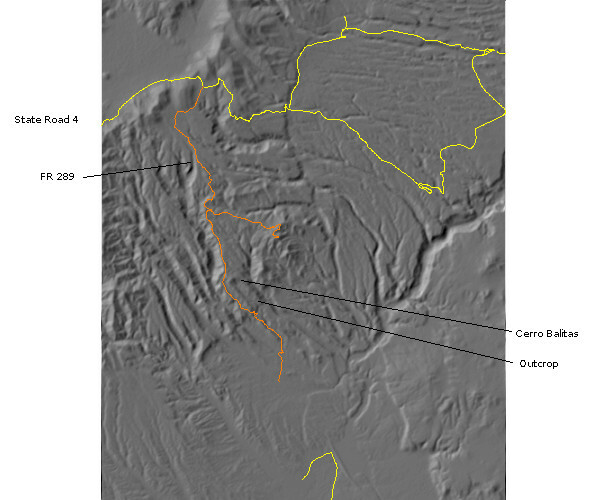 The unnamed small canyon in the fifth and sixth frames is parallel to a fault mapped in this area, though the fault is mapped on the far side of the opposite slope rather than along the canyon itself. The final two frames show the many layers of Peralta Tuff making up Cerro Balitas. Near this location, I came cross a truly lithic-rich tuff. 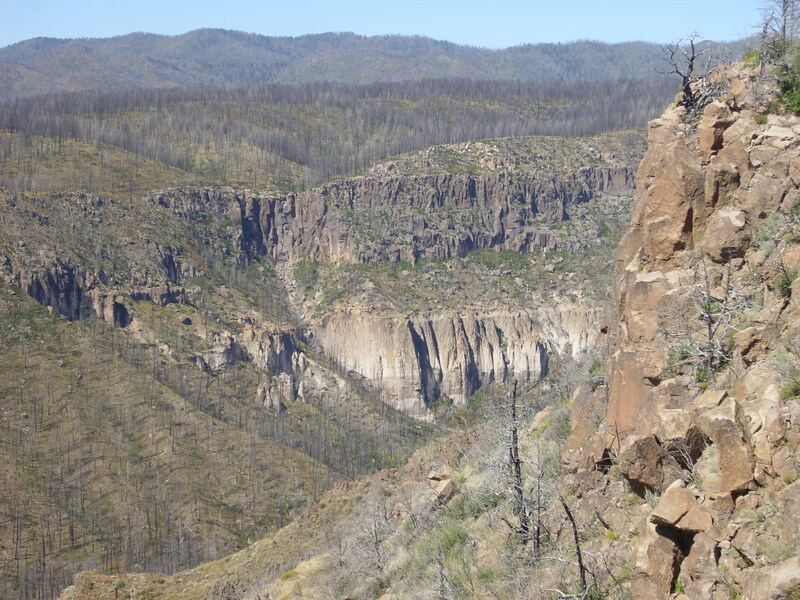 Looking east across Sanchez Canyon, I got a nice view of the rugged and complex geology on its southern slope. 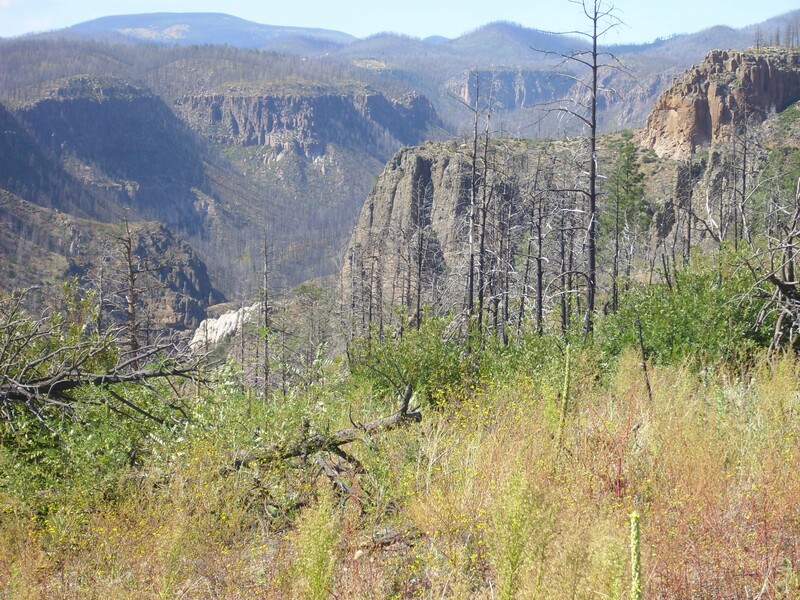 The cliffs partway down the side of the canyon, to the left and right, are Tshirege Member, Bandelier Tuff, which are remnants of flows that likely filled the ancestral Sanchez Canyon. 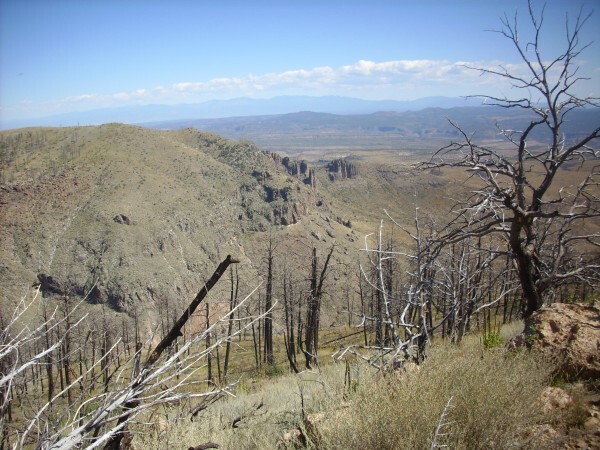 However, the light pink tuff on top of the far side of the canyon, just above and right of the center of the photograph, are the “pink tuffs” of the San Miguel Mountains. This has been identified as a tuff of the Canovas Canyon Rhyolite. Alas, this can be reached only by driving along the fairly rotten road to St. Peters Dome, then hiking a trail to north of Cerro Pico, then picking one’s way across the rugged slopes of Cerro Pico to this location. Some other day. As I proceeded on down the ridge, I came across a tuff unlike those I had previously seen. This is a lithic tuff, but the bits of rock appear to be composed of Bearhead Rhyolite, like the tuff itself. 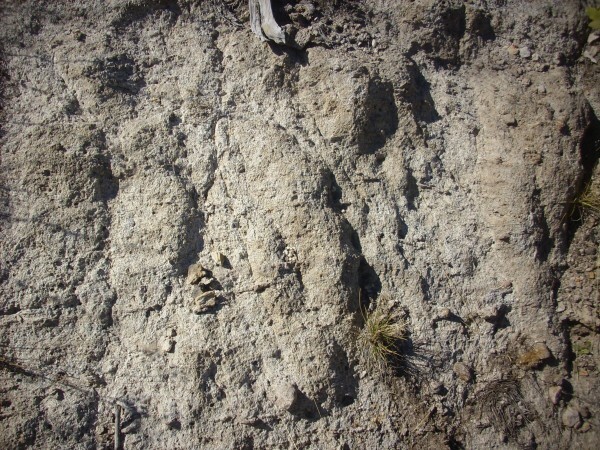 This is very likely an example of a block and ash flow, typically of high-silica volcanism. Magma high in silica is extremely viscous, flowing only with the greatest difficulty. As a result, when it erupts from a vent, it tends to dome up rather than flow away from the vent. Such domes can become tens of meters high. When the face of a dome becomes steep enough, the solid outer crust can collapse, exposing the gas-rich liquid magma within. This explodes into volcanic ash, which mingles with the fragments of the solid outer crust to produce a flow like the one here. It was about this point that I finally jettisoned some stupid. Some of you may already have been scratching your heads and wondering to yourselves: What’s with writing down coordinates from your GPS using paper and pencil? Doesn’t your GPS have a feature to record waypoints? Why, yes. Yes, it does. But it is a bit of electronics I got on long-term loan from a friend, and I honestly did not know. But while I’m dumb, I am not so dumb; as I was lamenting to myself the inability to record precise locations, the little bell finally went off in my head, and I started playing with the blasted gadget to see if it could record coordinates as well as receive them. Well, of course it could, and I figured it out after a few minutes. So I was back in business getting coordinates for photographs. Of which the first is this. In fact, one can trace the exact contact where the Peralta Tuff lapped up onto this ridge of older andesite. The white Peralta Tuff below the contact is partially mantled with bits of the darker Paliza Canyon rock, but the high-tuff mark is composed of particularly fine-grained Peralta Tuff, resembling surge beds, which seem common at the leading edge and base of a tuff flow. 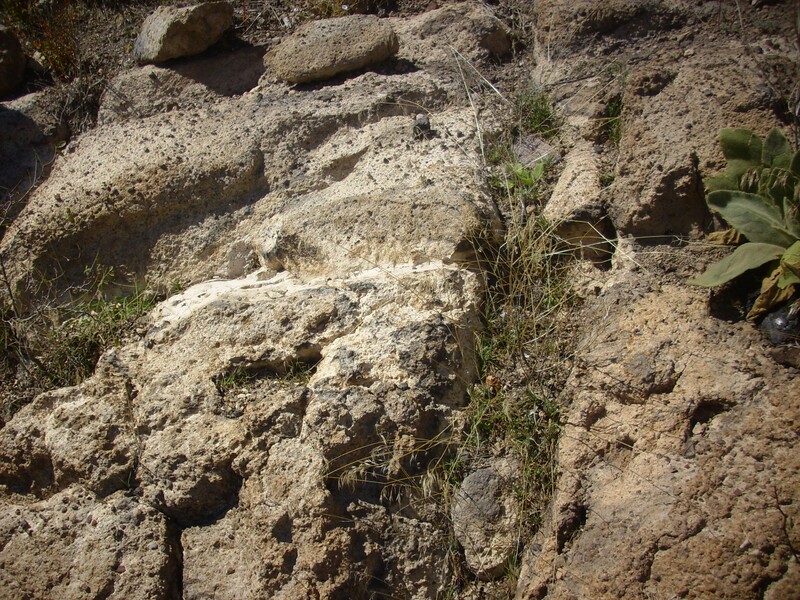 Surge beds form from a particularly gas-rich part of a pyroclastic flow, which rides up over intervening obstacles — the “surge” forming the surge beds. Time for another short panorama. Bit of a mystery here. 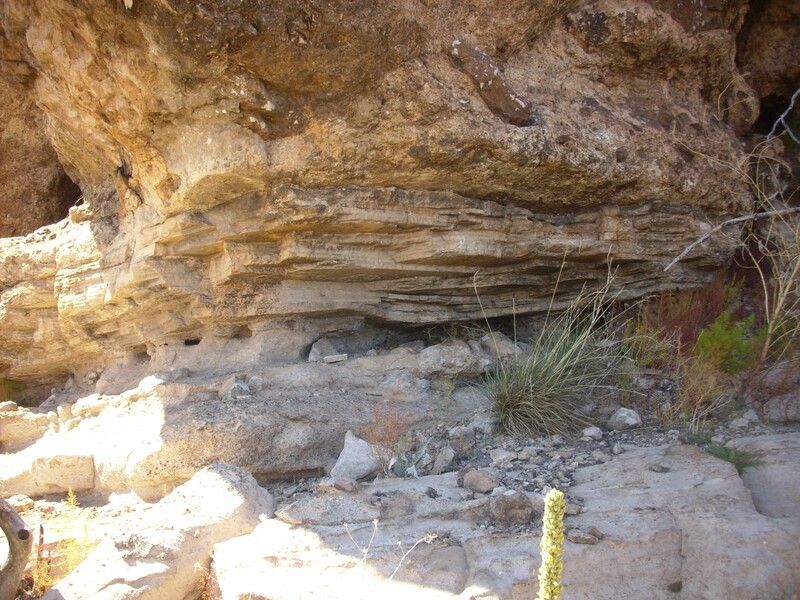 The thin tuff beds at the head of the small canyon dip fairly steeply to the southwest (left) but the beds beyond, on the far side of the canyon and in Cerro Balitas itself, are level. It’s hard for me to imagine that there isn’t a fault running down the canyon, but the only fault mapped in this area is just over the ridge on the far side of the canyon. Go figure. And one more. This doesn’t really show any geology I haven’t already photographed, but it is probably the most Ansel Adams moment photograph from this trip. From here, one has an excellent view to the east of the southeasternmost flank of the San Miguel Mountains. This is the same formation that I photographed in Cochiti Canyon earlier on this trip. 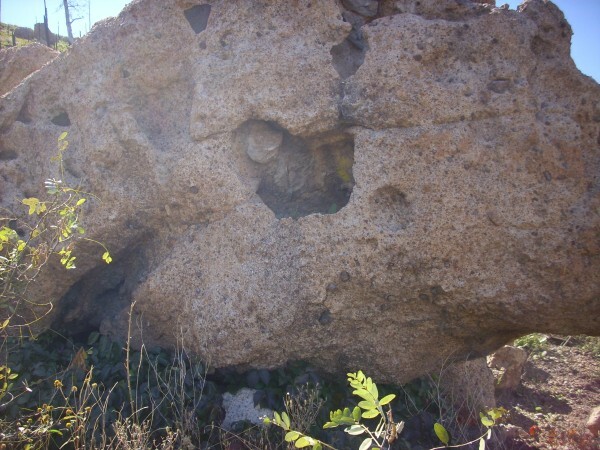 It has been dated here at 9.2 million years old — close to the age for the rocks in Cochiti Canyon. 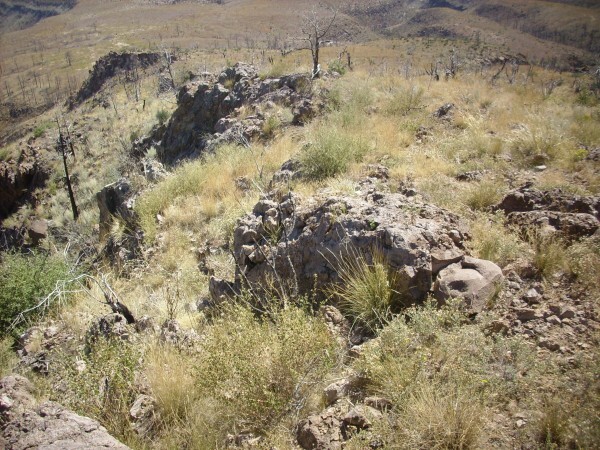 The dome above and to the left of the volcaniclastics is biotite dacite of the Paliza Canyon Formation. Well, maybe. 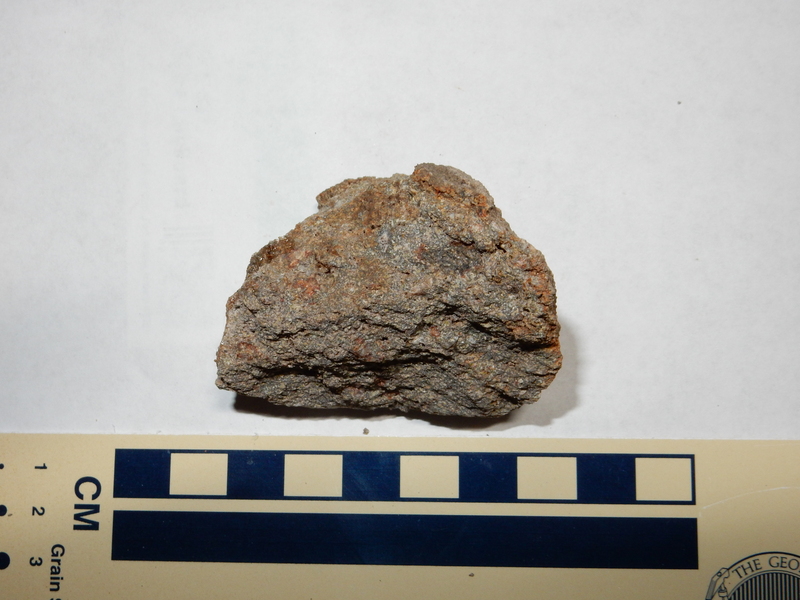 The area was blanketed with bits of scoraceous andesite from the small vent just to the south, and this purplish rock stood out, but it’s purplish. And it was sparkly with biotite flakes. There were also lots of phenocrysts of plagioclase. It looked like a dacite to me. 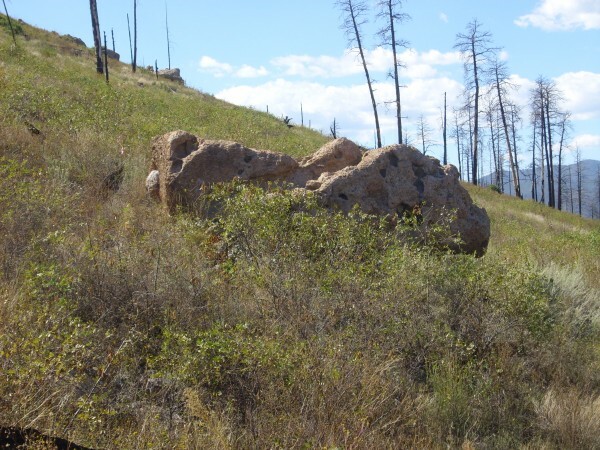 Now, understand, rock identification in the field can be problematic. 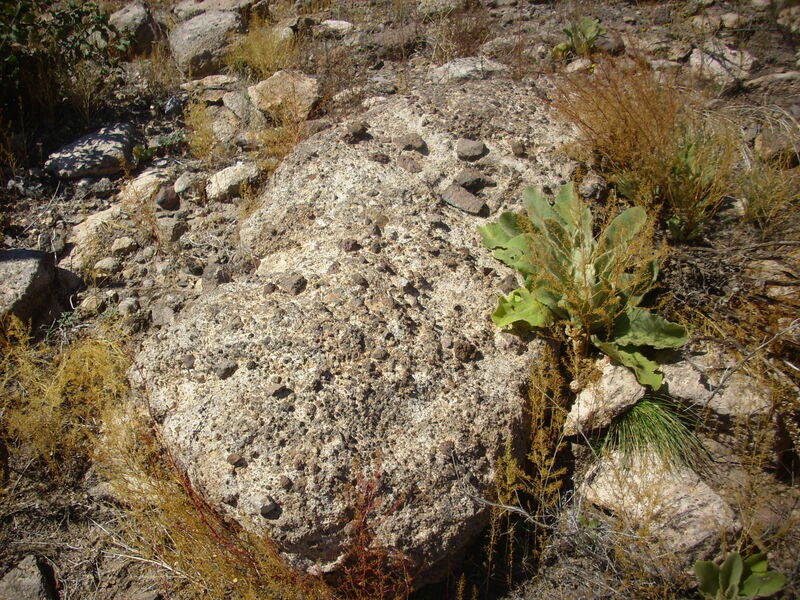 Rhyolite is usually light in color, but it can sometimes be quite dark. It is usually glassy or aphanitic, but it can sometimes have phenocrysts. And, anyway, the Canovas Canyon Rhyolite isn’t really all rhyolite; it includes some rhyodacite and even the occasional dacite. I checked my watch and decided I would hike past the andesite plug to the next mapped exposure of Canovas Canyon Formation. This exposure was pretty much a sure thing; my geologic map showed that a sample had actually been taken and dated (at 10.5 million years) from this location. I would hike to where I could practically see the sampling boreholes (“the mark of Fraser Goffnussen” 😉 ) and then I’d know for sure I had the right rock. The trip turned out to be worth it. 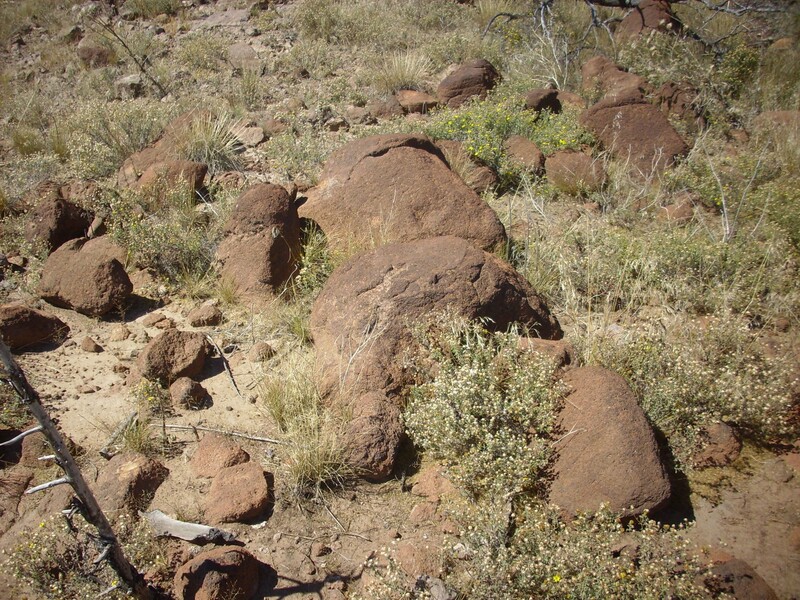 Here’s the andesite of the small dome, whose identity was fairly certain. Incidentally, olivine andesite is itself a bit of a mystery. I’ve played with the normative geology formulas, which tell you what assemblage of minerals you should get from magma with a given composition, and there simply isn’t a reasonable composition that gives you the intermediate silica content of andesite and the presence of significant olivine. Olivine is normally found only in low-silica rocks. A search of the Web failed to give enlightenment. So I’m guessing this is a non-equilibrium composition of some kind. Perhaps a basaltic magma containing phenocrysts of olivine absorbed some high-silica country rock on its way to the surface, and the olivine didn’t have time to resorb. 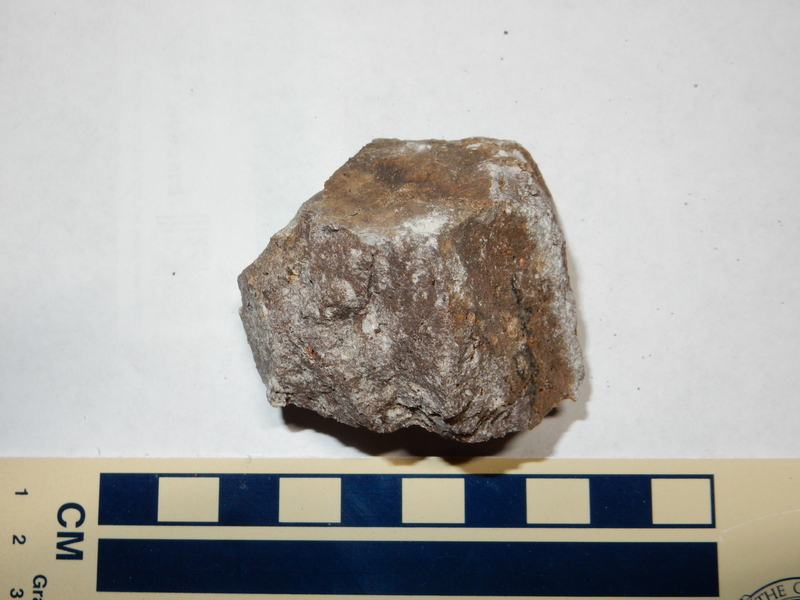 Under the distinctive rusty weathering surface, the rock does indeed look like an andesite. 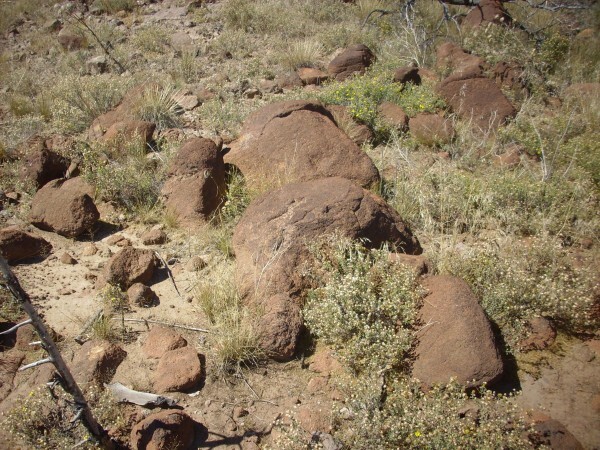 It is somewhat vesicular, typical for the top of a flow, and there are scattered blobs of what looks like iddingsite — a mixture of quartz and iron oxides formed by alteration of olivine. The view here was spectacular. Cerro Pico in the first frame, with the wild terrain to its southeast in the second and third frames. The fourth and fifth frames look down Sanchez Canyon to its confluence with White Rock Canyon. 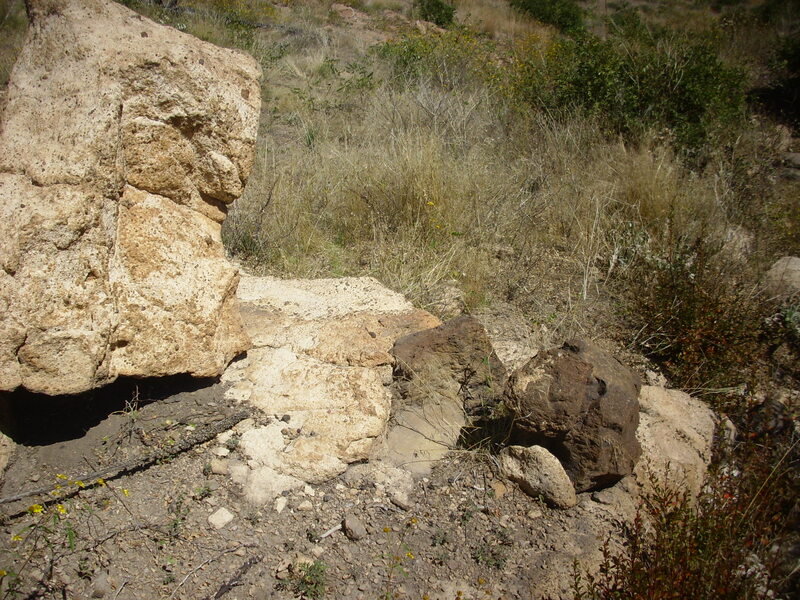 The outcrop here is very close to the point where my geologic map indicates Canovas Canyon Rhyolite was sampled and dated at 9.5 million years in age. This has gotta be it. Sure enough, the rock is identical in character to that I found up slope on the other side of the andesite vent, which I was unsure of. Here’s my sample. I still worry a little. 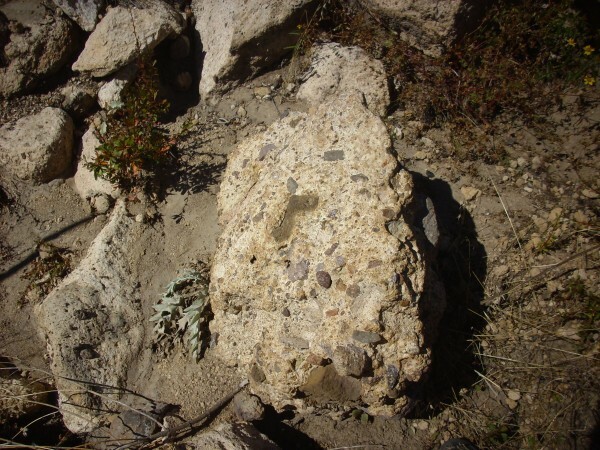 While rock of this type is found in both locations along this ridge that are mapped as Canovas Canyon Rhyolite, and this second sample in particular seems impossible not to be the sampled and dated outcrop, it looks just a little like the andesite sample shown earlier. Still. Under the loupe, one sees numerous flecks of biotite, large feldspar phenocrysts, and an occasional grain of what looks like quartz. I didn’t see anything else in the area that looked any different, so it was time to head back. I worked my way back over the andesite vent and prepared to climb back up onto the tuff flow. Sigh. It was going to be a long hike back, and my socks were already full of stickers. While scrambling up the flow, I ran across some impressive surge beds. 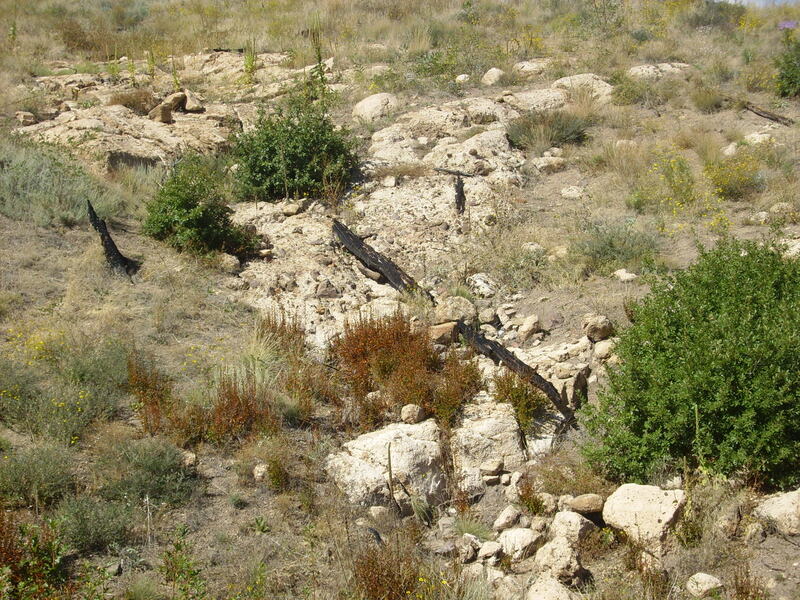 Surge beds are common at the start of a tuff eruption. This was towards the top of the ridge. It is clear that the ridge was formed by multiple flows, and not a single eruptive episode. I made the long, difficult trek back to my car. Coming around the northeast flank of Cerro Balitas, I briefly considered climbing up the peak to see if the thick beds at its top were different from the lithic tuff lower down. … Naw. Especially since there was a block of rock further down the slope that looked like it must have come off the top of the peak. I was slightly disappointed to find that this is lithic tuff not terribly different from what I’d seen earlier. So Cerro Balitas is a knob of tuff surrounded by tuff, except for an outcrop of solid rhyolite around the northwest flank (which I sampled in an earlier trip.) This was probably the actual eruptive center, which has mostly eroded away, leaving Cerro Balitas as a remnant. Getting to the boulder took me through wicked thick thorns and weeds, and I was well scratched and loaded with sticky seeds when I finally caught sight of my car again. On the drive back, I could not resist a couple more overlook pictures in Cochiti Canyon. 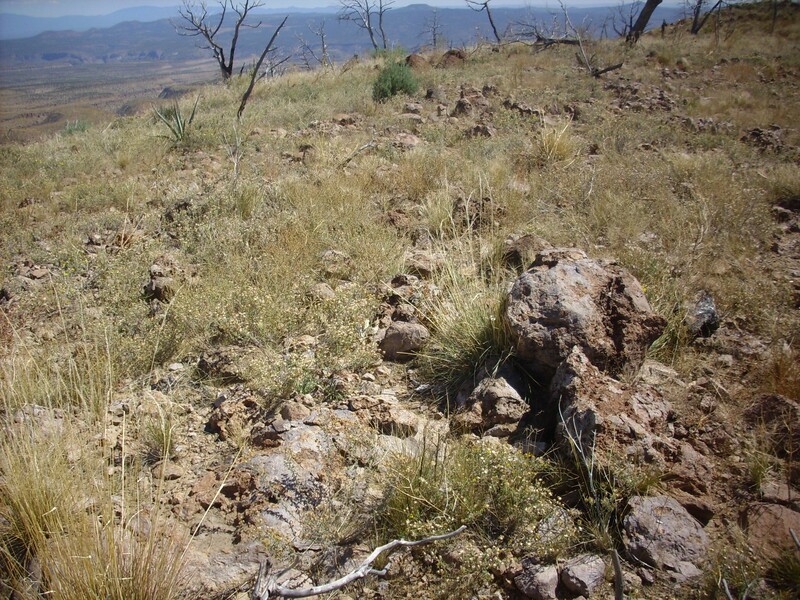 This one shows Tshirege Member, Bandelier Tuff, sitting directly on a topographic high of the old Paliza volcaniclastics beds. And home, tired, scratched, and sporiferous. I changed my socks as soon as I got home, but it took another half an hour to pull all the sticky seeds out of my shoes. WOW ! 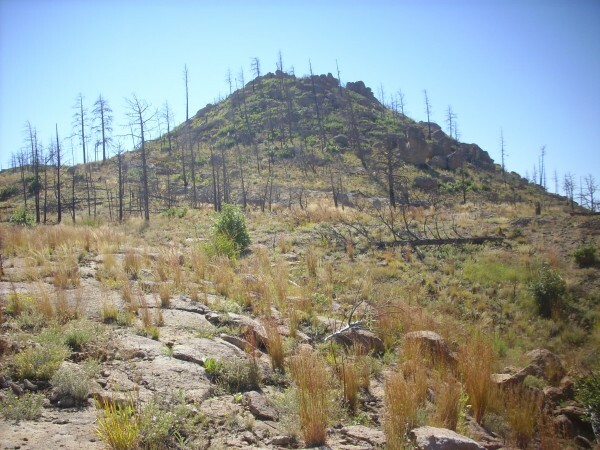 What in the world happened to the forest on this mountain? Geez!!! What a disaster ! ! ! What really disturbed me is not so much the image of the tree skeletons that remain but rather that I could see no evidence of forest regeneration on the mountain. Has anything changed since you were last there? There are a few small trees, but not much beyond that. We had a very hot fire in 2011 in heavily overgrown forest and the damage was pretty awful. 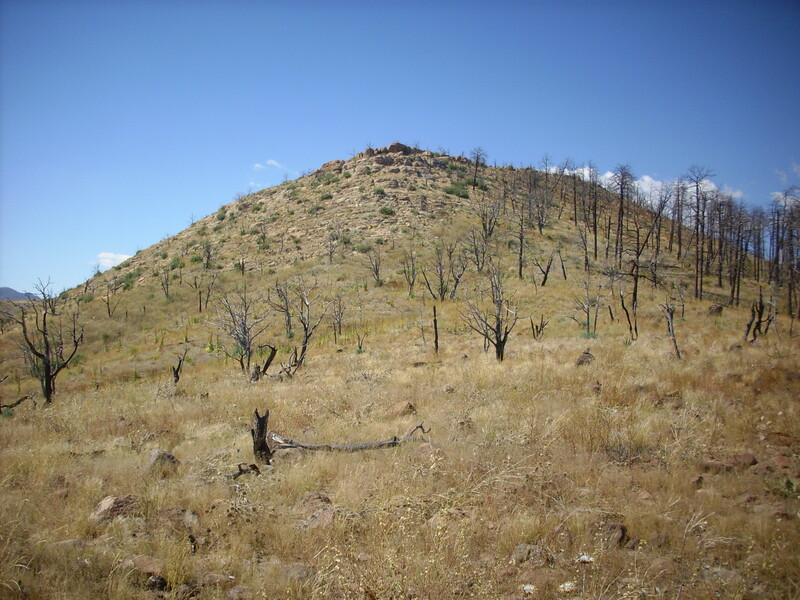 Part of it, though, is that this is at about the limit of the Upper Sonoran climate zone, where ponderosa gives way to pinon scrub. So it was kind of on the edge already.